Brown dwarf stars are extremely tiny and have very low mass, as stars go. In fact, they are so low in mass that there has been some debate as to whether some of them should actually be considered as planets instead. If we use the planet Jupiter as a standard, then brown dwarves can range from 13 Jupiter masses up to around 75. To compound things, all these "stars" seem to be roughly the same size as our largest planet, whatever their mass. Here we see an artist's impression of an actual brown dwarf. It is a companion to the star HD 29587, some 93 light years distant. The dwarf, known as HD 29587 B, is about 55 Jupiter masses. The closest example of these objects is Luhman 16, a binary system of brown dwarves only 6.5 light years away. Although designated "brown", there are slight varieties of hue within their classification. Each has been given its own spectral-type letter. 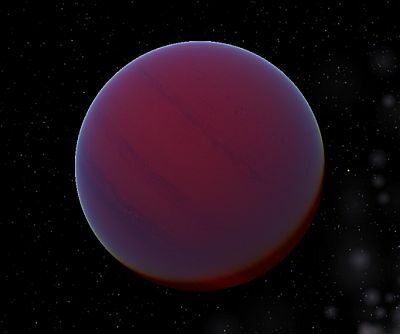 Although spectral class M stars are mainly red dwarves, those at the cooler end of the classification are considered to be brown dwarves and named "late-M dwarves". Displaying as a dirty red colour, they represent a sort of link between the two types of stars. As the term "spectral class" implies, stars are categorised by examining the absorption bands in their optical spectra. This class shows metal hydride and alkali metal bands, which class M does not. Stars in this class are purple-red. This is the classic brown dwarf star. Because of the absorption bands in its spectrum, it would actually appear, to human eyes, to be more a very rich, dark red colour. The coolest possible category, this was largely theoretical until the second decade of the 21st century. Then, a number of ultra-cool dwarves were discovered. Currently, 14 brown dwarves have been assigned class Y, the absolute coolest not giving off any light at all. In this regard, it could almost be considered a planet. So, Are They Stars Or Planets? When you consider that three of the planets in our own Solar System display similar characteristics to brown dwarf stars, you may be wondering what actually distinguishes them apart. Jupiter, Saturn and Neptune all give off more heat than they receive from the Sun, they have their own miniature planetary systems (their moons) and, in the case of Jupiter and Saturn, are comprised mostly of hydrogen and helium. 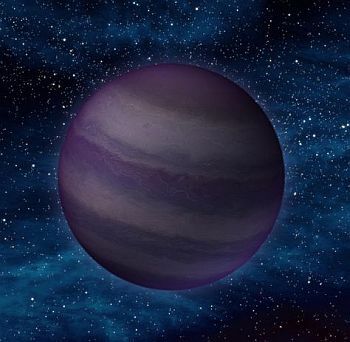 So, why aren't they considered brown dwarves? Once again, the International Astronomical Union comes to the rescue with a definition. They suggest that any body with more than 13 Jupiter masses is a brown dwarf, while anything less than that should be considered a planet. They chose this specific cut-off point as it is the minimum mass required for thermonuclear fusion of deuterium to take place. So, now you know.